Happy Monday people! This weekend went by in a flash! I didn't do anything too exciting.. just a bit of online shopping! I found some great deals! What about y'all? Did anything exciting happen? Love that top! Cute outfit girl! Nice outfit! Love your kimono with flowers. I did the same thing! I can't believe its monday already ugh! what a lovely kimono top ! you look great a casual fresh outfit !! really like it, well didnt to nothing special this week end, the wether is awful in my city so.. I stay in doors working !! that kimono top is great! Gorgeous outfit, love the sandals! Cute kimono top! Looks great with the bun too. Love this look! So feminine and pretty and I love your Top Knot! cute outfit dear :) love that kimono top ! I didn't do anything fun this weekend. Just worked. You kimono top is super cute. Looking really cute in that belted printed top! I love your sandals, btw. Great outfit :) I wore a kimono style top this weekend too! I went to a production of Spring Awakening, it was sooo good! And I LOVE Kimonos - though I don't own one yet... I'm currently obsessed / have seen a million adorable ones all over pinterest. I love yours on you! I will definitely have to go hunt one down! thanks for your comment! wanna follow each other? Love that top, the color and print are great! Such a cute Kimono. Love your heels too. This kimono is lovely!! I love the way you wear it!! Love the kimono and the way it looks with the belt! So pretty! Beautiful kimono. I love the way you've styled it! oh it looks so pretty! Love that top and your hair too! Your top and hair rock!! Lovely! I have been looking for a similar kimono and may have to look for this in my nearest JCPenney! Newest follower hope you can follow me as well! love the flowy top!! you look great! oh my gosh i need your outfit. What a fun top!! I love how floaty it is. LOVE that top!! So Fun! I love that kimono top! What a cute find! 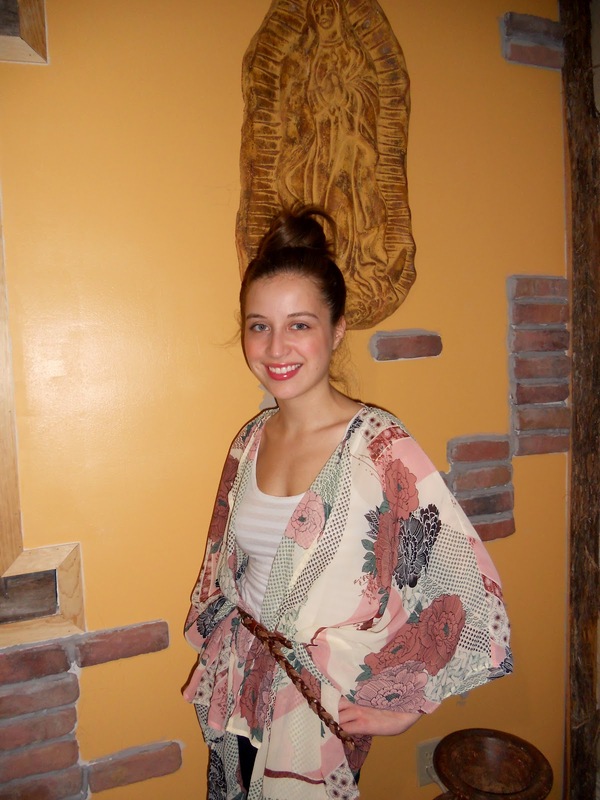 This kimono top is so pretty on you! Such a pretty kimono! Love how you belted it for a super chic look...they could border on super boho but this styling is so sophisticated and refined...great move! ok...i'm LOVING that kimono blouse! SO SO cute! Great looks, very nice style, I love it! You look amazing! Great photos - wonderful spring look! I love how you've wrapped that kimono around with the little belt. It looks great! Kimono top is so chic! I LOVE this. So adorable.